From wind mills to wind turbines over the space of less than 100 years. 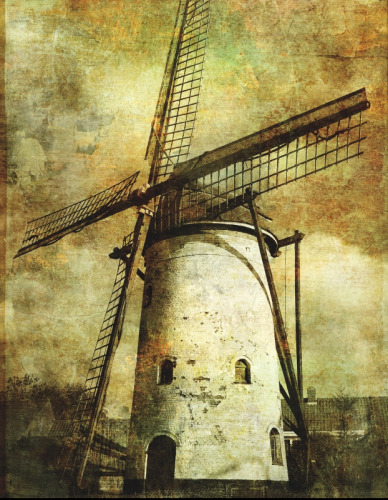 Horizontal axis wind mills have also been found in the Netherlands and the Mediterranean dating from 1300 to 1875 AD. In the U.S., over 6 million small wind machines were used for water pumping between 1850 and 1970, and the first electricity-generating wind turbine was erected in Cleveland, OH, in 1888. Wind turbines as we know them today date back to World War 1, when the use of 25 kW machines became widespread in Denmark. In the States, engineers were inspired by airplane propellers and monoplane wings. After World War 2 the three-blade, larger (up to 200 kW) wind turbines became popular in Denmark, whereas a series of advanced horizontal-axis designs were developed in Germany. The U.S. was to take an early lead however, with the Government’s involvement in wind energy after the 1973 oil crisis. From that year until 1986, the commercial wind turbine market evolved from domestic and agricultural (1-25 kW) to utility-interconnected wind farm applications (50-600 kW). 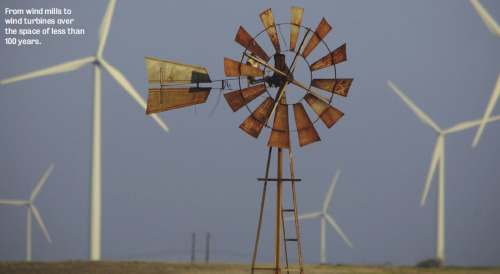 The first large-scale wind energy penetration outbreak was in California where 16,000 turbines sized 20-350 kW (totaling 1.7 GW) were installed between 1981 and 1990, as the result of incentives. After 1990, however, the U.S. lost its lead in many ways as most market activity shifted to Europe. Since the mid-1990s, the EU market has corresponded to over 50% of global installed capacity. In the years after 2000, European production of wind parks reached 70% with production of 100 TWh/year by the end of 2007. That said, in recent years, the U.S. market has picked up – but so has the industry in China. The EU still remains the world leader on wind, but with 10 GW installed in 2009, the US has made a comeback. However, China could overtake both markets with doubling of its cumulative capacity every year. India is also becoming an important player. Over the last 20 years, the trend has been for wind turbines to become bigger and bigger, but in recent years, this trend has stabilised somewhat with most wind turbines being around 2-3 MW in size, although turbines up to 10 MW are now underway. The use of pitch control has also increased with the ratio of pitch to stall machines increasing from 1:1 in 1997 to 4:1 by 2006. The introduction of variable speed, although inducing extra costs and additional losses in the variable speed drive, has allowed for increased energy capture below the rated power area and relief of loads, enhancement of the pitch and smooth power output above the rated power area. This has lead to a long-term increase in the mean annual capacity factor, exceeding 20% in 2007. The exploitation of wind energy per kW has also increased due to improved efficiency, sophisticated assessment of local wind potential, considerable reduction of downtime and upgrade of networks and operation of offshore applications. The cost of installed wind power was around US$4966/kW in the mid-1980s, but has stabilised between US$1419/kW and US$1986/kW in recent years. There are of course differences in the cost breakdown depending on the application. In onshore projects, the turbine is the critical cost element (~US$1319/kW), whereas this typically drops to 48% in offshore plants. On the other hand, offshore, the foundation requirements increase more than four times and grid connection in offshore is increased by more than US$213/kW. The specific investment cost for offshore applications is found to be higher by more than 40% for most of the plants in operation, and may increase to exceed even US$4256/kW for installations under construction. On the other hand, the employment of more turbines offshore implies relatively lower turnkey costs. The wind energy production cost is found to be comparable with the respective of conventional fossil-fueled generation methods, even without internalising the externalities. As a result, clear advantage of wind power in the economic field becomes evident, with estimations for near future electricity generation cost of onshore and offshore wind parks supporting values between US$71/MWh and US$114/MWh, and between US$106/MWh and US$170/MWh, respectively. The remarkable growth of the wind industry has largely been a result of various support mechanisms including price- and quantity-driven instruments such as feed-in tariff s, investment and production tax incentives, and quota along with tradable green certificates and tendering systems. A wind turbine requires primary lifecycle embodied energy amounts in the order of 1-3 MWh/kW, which usually implies energy payback periods of months, with the stage of manufacturing being the most demanding. Wind power also has a clear advantage compared with conventional power plants when considering externalities. If the EU, for example, realises its 2020 targets, estimations implies an avoidance of externalities in the amount of almost US$57 billion/year. However, although the majority of people (over 70% in a European survey) perceive wind energy positively, the increase in social support is being obscured by real-life not-in-my-backyard (NIMBY) attitudes – especially as the availability of good sites is becoming increasingly rare. Spatial planning through social and environmental consideration. Renewable Energy, official journal of the World Renewable Energy Network (WREN), seeks to promote and disseminate knowledge of the various topics and technologies of renewable energy. It is aimed at assisting researchers, economists, manufacturers, world agencies and societies to keep abreast of new developments in their specialist fields and to unite in finding alternative energy solutions to current issues such as the greenhouse effect and the depletion of the ozone layer.